When attending in person it was not simply the names that were astounding, it was the dizzying tallness that truly set one reeling. I’m not tall, I know that, but I’ve always felt about average until I came into contact with the Dutch. It’s an odd sensation to stand, as a grown man, at shoulder height to another person. It is truly humbling to stand at shoulder height to an entire room of other people. But then we worshiped together, and talked, and ate together, and I loved them. It was there that I encountered Christians who have been deeply shaped by a stream of Protestant theology that I did not know well; Kuyperian Calvinism. Now, I was no true Calvinist, nor am I now. But these infinitely tall Kuyper fans taught me gently about a kind of cultural engagement that I had, until then, denigrated. They taught me about a love for culture. They taught me about a grace-filled engagement with art, and politics, and food. They spoke a language that struck deeply resonant notes in the depths of my heart. The tension between life as a Christian and life in the culture to which I have been born and in which I was raised has always been difficult for me. I had reached, by the time we moved to Hamilton, a kind of uneasy truce with my culture, but nothing more. It was the Dutch who taught me better. I saw people who truly believed that their work, whatever that happened to be, had a redemptive purpose grounded in the work of Christ. It brought a great dignity to all work, from teaching to framing to lawyering to sculpting. It all, somehow, became art. It wasn’t just the pastors or missionaries who talked about vocation, it was everybody. Don’t get me wrong, I still think postmillenial theology is kind of a wild pipe-dream, and I don’t think anybody will ever talk me into being a real Calvinist (though they came surprisingly close on child baptism a couple of times). But life among the Dutch was a powerful and beautiful thing. It altered Jinny and I in subtle but powerful ways, and I’m deeply thankful for that short sojourn. *Okay, they weren’t all actually Dutch, but there were a lot of Dutch people man! Like, a lot! One of the joys of being home in Saskatchewan right now is that I get to spend time with my sister Terry and her husband Tim. Of all of our family we’ve probably seen the least of them since we moved out to Ontario a few years ago, and so it was great to spend some time catching up this past weekend. Last night was my mother’s retirement party, and while my parents and their friends were upstairs chatting away, Terry, Tim, and I were hanging out in the basement, and drinking very good wine. The topic of conversation? Television. There are a lot of people in the world who are hard on TV, but I’m not one of them. I love television, and I tend to think that in the past 10 years or so the medium has been used to present art to rival feature length motion pictures. I also think that television is an excellent and intriguing barometer for a given culture. Plus it’s lots of fun :). Anyways, all of this to say that we had a long conversation about great TV shows that culminated in our attempts to pick our All Time, Desert Island, Top Five Television Programs. Here’s my list, with justifications, and a few honorable mentions. 1. The Wire. This is the best television program ever made. It is powerful, demanding, perfectly executed, and totally engrossing. Each of its five seasons progresses like a well-crafted novel, with each episode serving as a chapter. There are no freebies for the viewer here. If you can’t follow, the producers aren’t going to help you keep up. The Wire also has some of the best characters I’ve ever seen on the small screen. McNulty, the darkly flawed homicide detective whom you love, but very often want to punch in the face. Bubbles, who’s story arc exemplifies redemption as it really is (in this world at least)…difficult, painful, incomplete, and heart-breakingly beautiful. Marlo, the coldest, cruelest, and perhaps the most starkly real of all The Wire’s cast. Finally, The Wire deals with many of the themes you find in other programs (drugs, crime, justice/injustice, politics, morality, race, etc), but the difference is, this is probably the only show where these themes are presented as systemic issues. Crime is related to poverty, which is related to politics, which is related to economics, which is related to race, which is related to justice, which is related to morality, which is related to…and so forth. 2. The West Wing. Before watching The Wire, The West Wing would have easily been #1. Now I see it as a kind of naive idealism to offset The Wire’s stark realism. The West Wing is about the world as it should be. It is hopeful, heartwarming, and very funny. Of course it is also, in a way, entirely false. Or perhaps “fabricated” is better. Nobody talks the way the WW characters talk…hell, nobody acts the way they act. But the world would probably be a better place if they did. 3. Buffy the Vampire Slayer. Buffy is pure gold. It’s funny, action packed, cheesy, ridiculous, and (most importantly) entirely self-conscious. Usually “self-conscious” is something I’d say to disparage a film or TV show, as a way of suggesting that the writers and director were sitting in the room with you while you watched their show, constantly elbowing you in the ribs saying “get it? get it? wasn’t that great?” But that’s not how I feel when I watch Buffy. When I watch Buffy I feel like Joss Whedon (the creative mind behind the show) is sitting in the room with me, wearing an ironic smirk, and laughing at all the parts I laugh at. Buffy is also on the list because of the way that it combines unadulterated, b-level, vampire-camp with serious themes and great artistry. The following episodes are exemplars: Hush, The Body, Once More With Feeling. Also, it’s funny as hell. 4. Doctor Who. When I was a kid, round about eight years old, every Saturday night my dad and I would make popcorn with butter and salt, and then sit down and watch Doctor Who on the CBC. This was re-runs of the old series mind you. The doctor I knew best was the Fourth Doctor, played by Tom Baker, with his long scarf and love for jelly babies. But dad and I had this ritual for years, so I also knew the fifth and sixth Doctors, and we even got the occasional re-run from the time of the first and second Doctors, which were shot in B&W. I suppose that I could go on about how foundational Doctor Who is as both a British cultural icon and one of the great forerunners to modern science-fiction. I could say something about how the late, great Douglas Adams was a writer for the show for a little while. But I don’t really need to do I? I used to stay up late on Saturdays, and watch Doctor Who while eating popcorn with my dad out of our red Tupperware bowl. That’s why it’s on the list. 5. Modern Family. This was a tough spot, and several of the honorable mentions almost made the cut, but I decided in the end that Modern Family deserves a spot. Why? Because it’s funny. Actually it’s not just funny, it’s funnier. Think of something funny. Modern Family is funnier than that. Honorable mentions: Lost, Rome, Arrested Development, Big Love, Battlestar Gallactica (the new series). 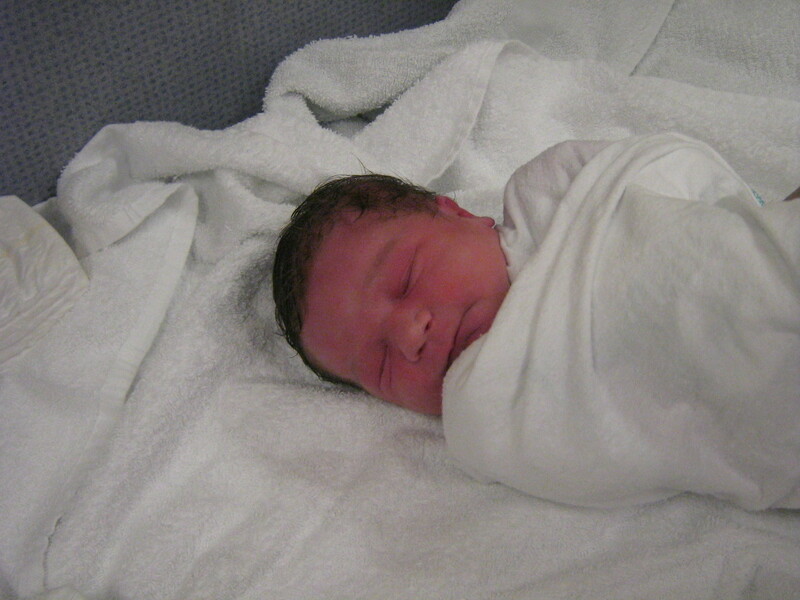 Well folks, meet my brand new little girl, born by c-section this afternoon at 1:44, 8lbs, 4oz. Ainsley and mommy are both doing great. Okay all of you Hebrew linguistics nerds out there, I need a little help. I’m putting together my reading lists for my comprehensive exams, and one of them will be on modern linguistics and biblical Hebrew. So hit me, your best monograph recommendations, either with regard to general linguistic theory, or to the application of modern linguistic theories to biblical Hebrew especially. I have a lot of ideas already (more than I probably need), but I thought somebody out there might be able to point me in the direction of something I would never have come across otherwise. Thanks in advance. The year after I graduated from high school I worked as a laborer at a company called Nu-Fab. Nu-Fab builds pre-fabricated housing products, including things like pre-made walls, laminated beams, gable ends and gable ladders, and (most of all) roof trusses. I spent almost all of my time at Nu-Fab building roof trusses. It was not a good job. I still get a Pavlovian shiver down my spine whenever I’m home in Saskatoon and happen to drive by that building on 45th St.West. I worked there for a little under a year, building roof trusses day in and day out. A few years later I was working at a small church in rural Manitoba, and we were planning a trip down to an orphanage in Mexico. We were going for about a week, and we would be spending a significant portion of that time building two new houses for the people there. While I was talking to my senior pastor it came out that I used to work at a place that built pre-fabricated houses, and that I spent almost a year building roof trusses. He asked me if I would be able to help out designing or building the roof system for the houses we were going to be building. The answer, as anybody who has ever worked on a factory floor could guess, was “no.” I could swing a hammer, I could run the pneumatic press, and I could read the set of directions provided by the drafters and engineers. Given a bunch of wood and a saw I was lost. I’ve recently started reading an awful lot of Roland Boer’s work, and tonight I began reading his Political Grace. In the Introduction he discusses the question of what he refers to as “Taylorization,” which is basically the assembly-line process for manufacturing that Henry Ford perfected and popularized (Boer xviii). Boer challenges the notion that stark lines can be drawn between things like theology and economics and philosophy and whatnot, as well as the idea that one or another of these can be used to explain all of the rest (economics as an explanation for religion, or religion as an explanation for politics, etc). With regard to Calvin he writes, “[my] study of Calvin leads me to suggest that we need to drop this harmful approach and realize that such a Taylorization is a fiction” (xviii). He is, of course, utterly correct. We do not need more line laborers in the great factory of academia. We don’t need more thinkers with skills and mindsets analagous to my truss-building expertise. We need something else. We need synthetic, integrative thinkers. We need people who’s thinking is more analagous to my father’s truss-building skills. You see, my dad is a carpenter of the first order. When he wanted to build an extension onto the back of his garage so that he’d have a dedicated workshop, he didn’t go to Nu-Fab to buy pre-fabricated trusses. Instead he taught himself to use AutoCAD, then taught himself to design some simple 5/12 pitch trusses, then he built from scratch the jigs and set-ups required, and then he made his own trusses. And you know what? They were better than the trusses I made. My dad is a synthetic builder. I want to be a synthetic thinker and writer. So screw Taylorization…let’s start exploring how our thoughts about God and reality and government and social relationships and capital and everything else overlap and inform each other, and then move on from there.